While speculations have been in the air for quite a while now along with many questions about possibly the most awaited bike from Hyosung Garware stables, the GT250R. Till now Hyosung has been a niche player in the Indian market with its 650cc GT brothers and the tall lanky 678cc ST7 cruiser. You can click on any image to open it in higher resolution. Remember the erstwhile Comet or Aquila? If you have ridden it anytime in your life, you would know how potent those masculine machines were! But since they were brought in limited numbers we do not have many owners nor any widespread ‘feel’ of the product. Till Honda CBR250R was launched Ninja 250R was the lone ranger in this segment and now with the launch of R Comet (GT250R) in India, it’s a trio! 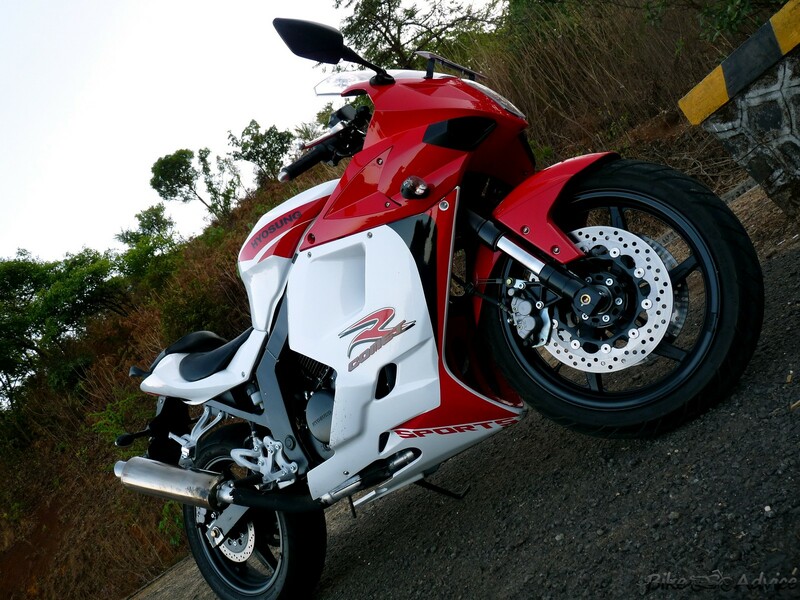 In this review of mine, I would not touch much of Ninja-CBR-Comet’s rivalry (apart from a few references), it would be more about the bike in hand and its elder siblings. So let’s get to business! The smallest Hyosung in India is powered by a 249cc 8 valve DOHC twin cylinder engine separated at 75 degrees from each other. 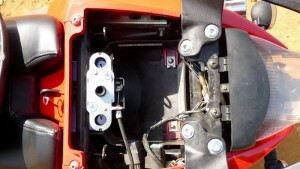 Fuelling duties are performed by Hyosung’s Electronic Fuel Injection. The quarter liter mill is capable of producing a maximum power output of 27.61bhp at a high 10000 rpm. This figure sits right in between CBR and Ninja, it is 2.61bhp more than CBR and ~5 bhp lesser than the Kawasaki. Maximum torque is 22.07Nm maxing at 8000 rpm which is in the leagues of the current crop of 250s available in India. Let’s talk about the on-road performance. Plonk in the keys, crank the starter, flip the throttle a wee bit and here comes to life the best sound heard on any Indian motorcycle in and under this segment. The biggest surprise is its refinement, not in comparison with others in this segment but relative when compared with its own elder siblings. Frankly speaking, the two most disheartening features of GT650R and its naked sibling are the erratic fuel delivery and harsher engine. Surprisingly, GT250R is as clean as others are both in terms of very proper and consistent fuelling as well as engine refinement. Unlike the Ninja’s exponential curve where power boosts up at higher rpms, GT has a very linear power delivery. It pumps in from the word go (nearly) and doesn’t drop till highish revs. 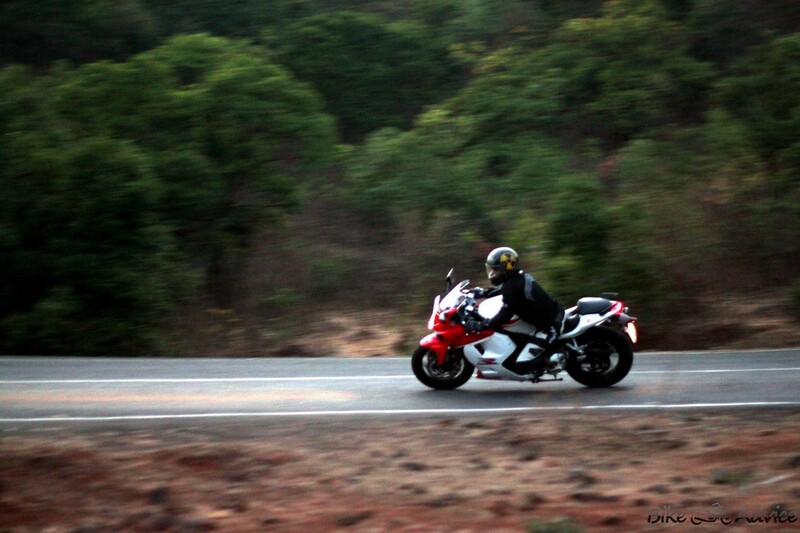 The best I felt the GT feels in is the traditional Hyosung’s 4000 to 8000 rpm. Now this statement would raise a question; then what about the peak power output rpms? At anything over 9000 rpm, the bike begins to rattle, vibrations starts creeping in and somewhere around the 11k rpm the cut-off ruin things. I must specifically tell you that the vibrations or the rattle I mentioned here are at least 200% percent lesser than the 650cc engine and this is one big achievement for Hyosung and this is also one of the best things I liked about this bike. I am sure the engine characteristics would be liked by majority of the critics who were basing their perception about this bike after riding its 650cc brothers. This bike does vibrate somewhere in the mid-range of 5-6k rpm at the footpegs and handlebars but they are nothing of a worry. Once again the torque spread is linear and fairly satisfying; however, GT does take a little bit of an effort pulling from low speeds in lower gears (along with some metal scrubbing sounds from within). I guess this is the resultant of huge weight this bike carries with it. Similar to GT650, clutch is slightly heavier. Transmission is a 5-speed 1-down 4-up box which is a little cluttery. The gears do not get properly slotted and there are occasions I found hitting false neutral. Also while shifting from 1st to 2nd I ended up on Neutral at least 10% of times.I would not call this as a deficiency but possibly a ride on Ninja side-by-side had I spoilt! Gear changes were not effort taking but putting them in correct slots was something I desired from this bike. Since Hyosung had to spread all the power delivery in 5 gears only, it has done a fairly good job. The gear ratios are spread well to lend an early flight and a higher top speed. It doesn’t feel at anytime that any gear is eating up on the subsequent one’s job. Summing it up, the power delivery is very linear, exhaust note is awesome specially as the revs build up and the engine is big time refined compared to its its bigger siblings. Transmission needs bettering and removal of clunkiness! 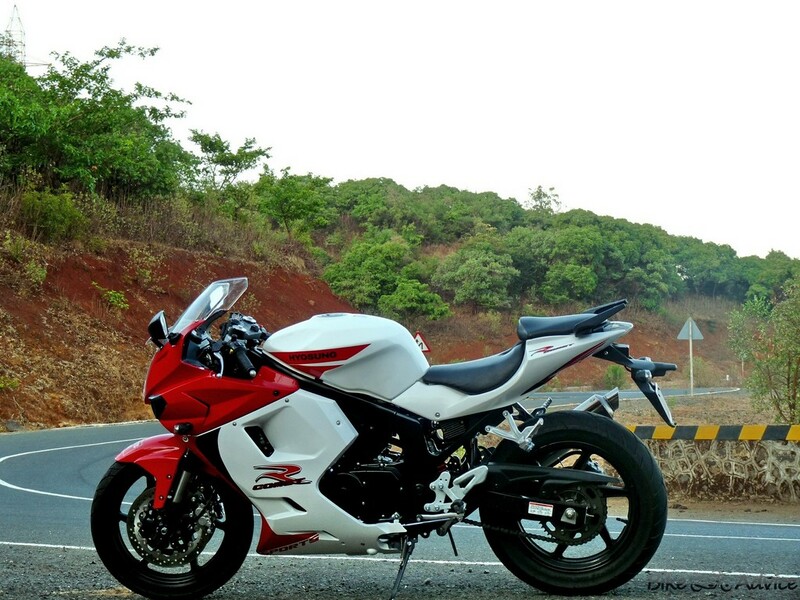 Hyosung is betting big on this bike’s BIG looks and plans to excel and make it GT’s USP. And truly the styling of this bike lends it a character which no other bike in, under and till 650cc has (obviously apart from its own sibling). Generally smaller bikes are ‘smallened’ siblings of their bigger counterparts but GT250R is an exact replica of GT650R with a few bits changed here and there. I bet if both the bikes stand side by side without any stickers, it would be very hard to tell which one is GT250R, such is the resemblance. Right from the front tip to the rear hugger, the bike exudes style, then be it vertically stacked projector headlamps or the sharply pointed tiny tail-lamp, everything makes a statement. Unlike the Ninja, this bike is curvier and bigger. The bike we got was the Red/white combo and this looks much better than the other black/red option. The huge tyres, dummy air scoops, big and muscular fairing together constitute the big bike feel in GT along with a huge 17 liter tank, up-swept exhaust and tail. 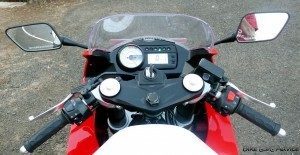 The grab rails are a direct lift from GT650R and are as functional as ever. The combination of Red and white on our test bike stood out and might be the best selling color out of the two (we do not know what other colors would be on offer as of now). 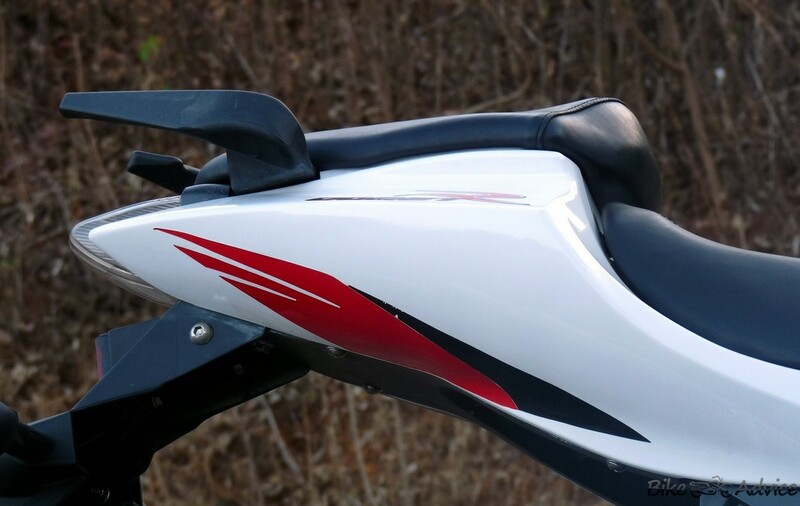 The red upper semi fairing, front mudguard and little dashes around the whole body on the base white color are a treat to look at. Hyosung might be promoting this bike as Comet R or R Comet according to the decals painted on the bike to cash in on the already established ‘Comet’ brand. The major differentiators between the GT250R and the GT650R are the exhaust and tyres, else it all remains similar. There is an obvious gap around the engine which does reveal, on careful observation, that the mill is smaller form of 650R. 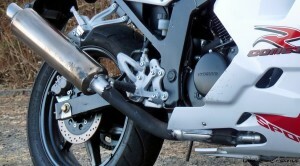 The exhaust’s end can is chromed and the connecting pipe is powder coated. However, on our test bike there was some ‘burn/rust’ on the can and a little irregularity at the joint. 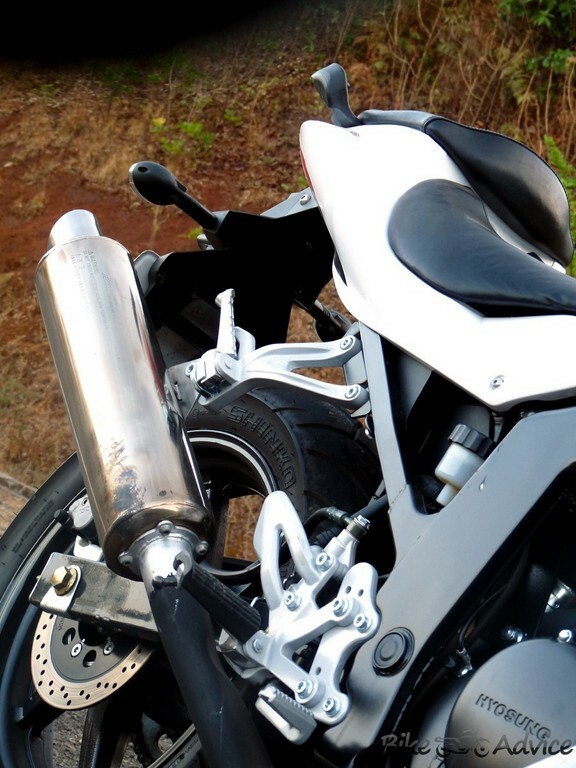 My speculations is that Hyosung might have done a bit of tinkering to this Indian version. These mismatches are however not bound to make it to the production versions as we expect. Fit and finish on the overall bike was pretty good and definitely better than Hyosung’s earlier variants. However, there are a few areas where Hyosung needs to concentrate on. The paint quality especially on our red/white combo was fantastic. It must be mentioned that under no circumstances did we hear any kind of fairing rattle. Finally, the biggest 250cc bike in town is here to provide elite class disguise and it does it successfully. The bike looks at least ‘half a dozen’ bigger than the Ninja. 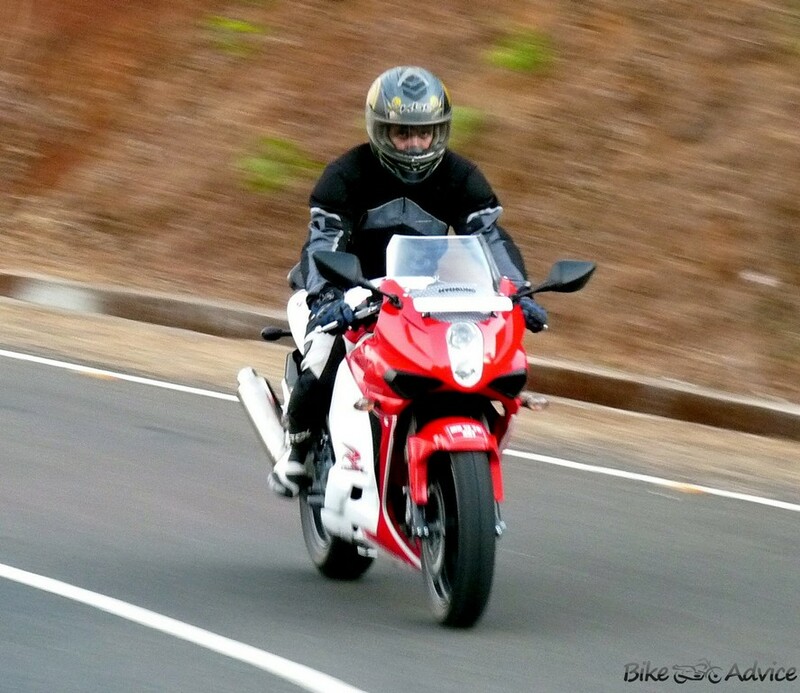 ­Hyosung GT250R RIDE, HANDLING & BRAKING: Plush ride, fantastic but heavy handler, braking NOT confidence inspiring. GT250R, with its big bulbous looks, heavy weight and forward biased posture does promise to be a good rider. 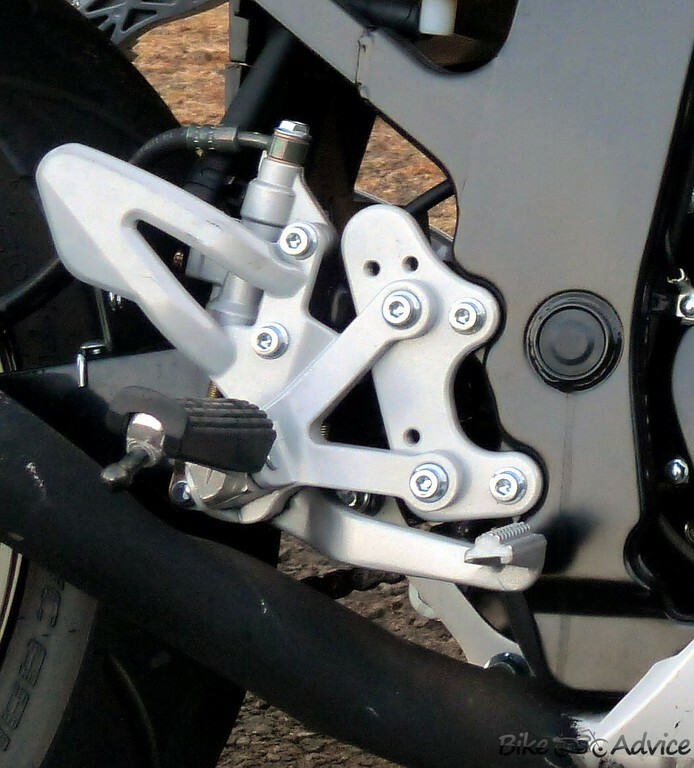 The complete bike sits on a steel perimeter type frame aided by a rectangular section swingarm. The cushioning duties are done by thick 41mm upside-down telescopic forks upfront and a red colored mono-shock with adjustable preload at the rear. The suspension are an optimum of hard and soft however there is one peculiar behavior that was brought to our notice. The front rebounds back as if it wants to hit you back, with vengeance. This might cause issues on speed-breakers or potholes or at times where your front has to play a vital role. Not a big issue but we could not understand the rationale behind this. The ride quality is absolutely plush. High speed stability is this bikes forte. At triple digit speeds it feels very assuring and rock-solid. However, at tight corners, it doesn’t display the aplomb or the benchmark set by others. It doesn’t mean its bad but the confidence and the reassuring feel is somewhere desired. The bike does feel heavy when you are already committed on a corner. However, the bike remains predictable and never gets on you while cornering. The super-sport posture does help and no part of the bike play spoilsport, though. This bike weighs an insane 188kgs full, and this does take efforts to control when you are trying to turn the bike. A little mistake and the bike tends to tip over and you would need all of your power to keep it upright back again. Also, similar to the GT650R, this bike takes eons of quarters of land to take a turn because of its restricted front wheel play. 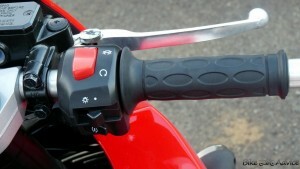 Also, you need to take your hand off the bike’s levers when the steering is on its complete angles either side. GT uses 17 inch 110/70 at the front and 150/70 Shinko (ST7 fame) tubeless tyres. It uses 300mm twin semi floating discs at the front and a single 230mm disc at the rear. And you might think this is a recipe of its capabilities? No, in fact these are the two factors which disappoint the most. Feel from the lever is not what the two rounded plates give an impression of. 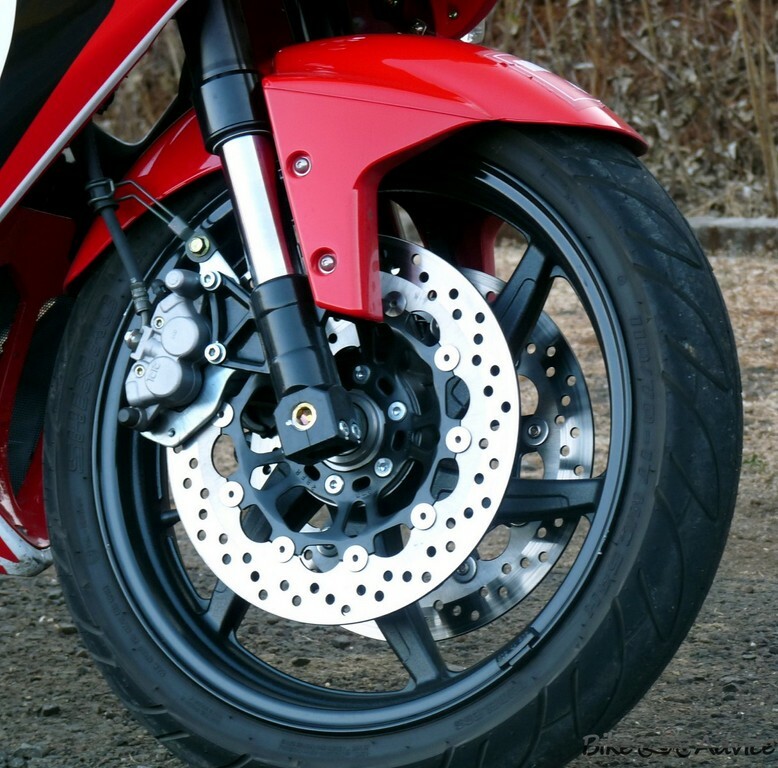 Braking at high speeds doesn’t make the bike nervous but it doesn’t pull the bike’s speed down at the same proportion either. With a typical character of lesser engine braking of V-twins, it makes it a little concerning. 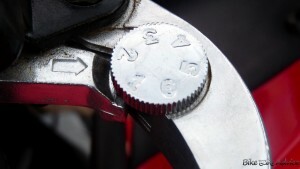 Add to that the front brake lever adjuster’s foulplay which returned to position ‘6’ whenever I put it on ‘1’ at its will. I had to finally settle for ‘2’ to ensure it works! Ride quality, straight-line ability are this bike’s forte. Shinko tyres could have done a better job. 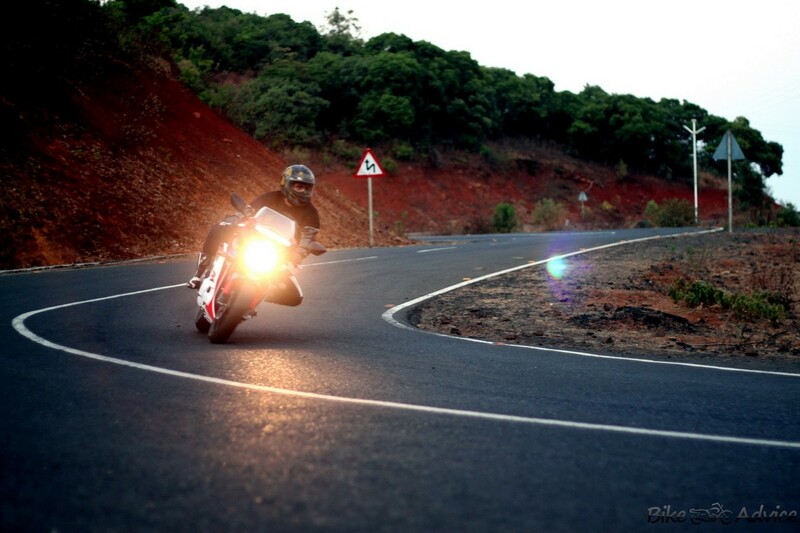 Riding posture and bikes dynamics help in corners but braking is definitely a sore point despite all that gadgetry! The instrumentation of the GT250R is an exact replica of GT650R with a couple of differences. 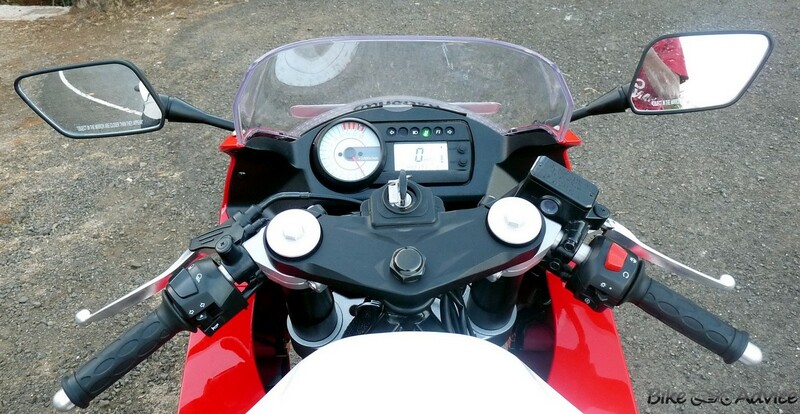 The tachometer has a bright background instead of black of 650R and there is no temperature gauge on the 250R, which possibly is an intentional miss! The white colored analogue tacho is calibrated till 13k rpm redlining at 10.5k. 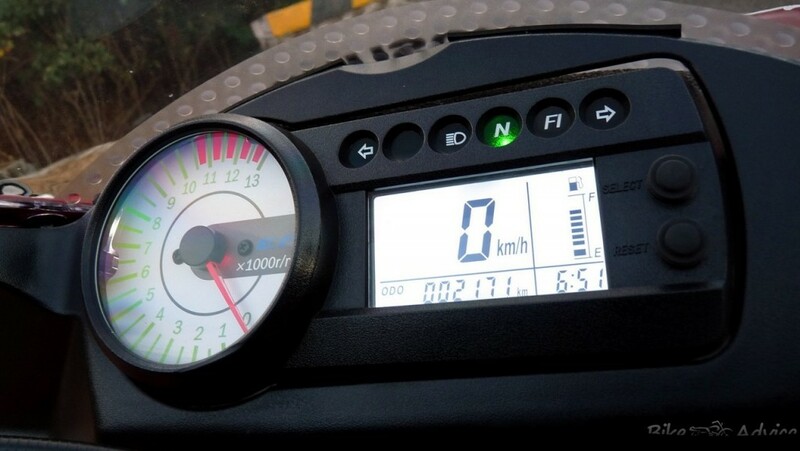 The digital part shares with you the information on speed in km/h in big bold letters, odometer, tripmeter, clock, and fuel gauge. The two buttons at the right can be used to reset the tripmeter and clock. The console then have the regular tell-tale lights – side blinker indicators, low-fuel warning, upper beam, neutral and FI. Switchgear also comprises of all the regular elements of today’s bikes – engine kill switch, light on/off, starter towards the right and pass-on, upper/lower beam, side blinkers and horn towards the left. GT250R doesn’t come with GT650R’s hazard switch. Unlike the 650R which has daylight running lower projector, 250R doesn’t have that. Horn is not loud but that we understand is because of Indian guidelines. A few buttons are small but overall switchgear has good ‘quality’ feel from them. In the foreign developed markets, 250cc is the bare bones learning bikes for people allowing them to graduate to higher, bigger bikes. However, in India it is exactly the opposite of that. 250cc machines are a considered to be a big premium and with everyday’s increasing prices of petrol they are not perceived to be something which Indian money should buy! Anyways coming to the point, the GT250Rs best part is its power flow. The power delivery is almost the opposite of what the Ninja provides, absolutely linear. As it comes to life, power starts to peep in and there are no mid-rpm tantrums or spikes anywhere in between the whole rev range. Pardon a few initial revs, GT pumps up well and goes on to a lovely mid range with a slightly expected weaker high end performance. In the initial revs, there is a little lag in power delivery but these rpms are absolutely limited till, say, 2500-3000. After this mark, GT sings its own tune and with high rpm gear changes launches on to a top speed of over 150kmph on the speedo. While I was concentrating more on the overall behavior of the bike, Rishabh (our co-tester) managed to scorch this bike till 156 kmph on the speedo! And this bring us to an interesting point. There is something with the number ‘6’ here which we noticed. 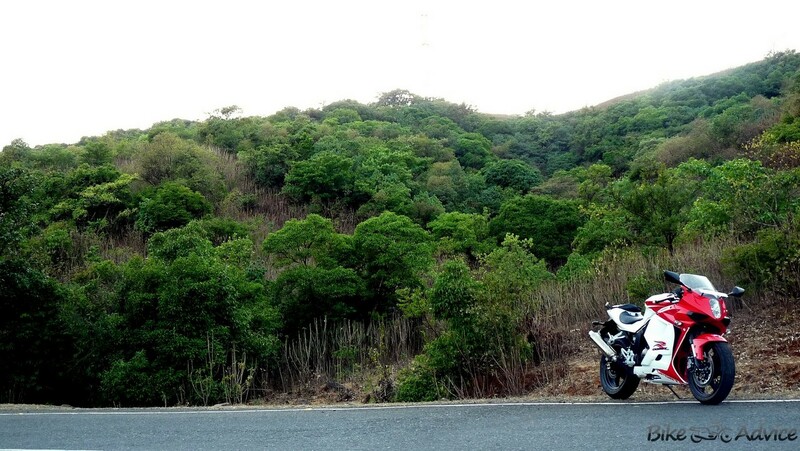 The bike cuts-off at 56kmph in 1st and 106kmph in third gear. The top speed achieved was also 156kmph. Till 4th gear, response is sound but it dulls out in 5th gear which feels a tad too tall. People have been talking about the lack of 6th gear in this bike, but frankly speaking, 5 gears do their job pretty well and there is nothing extra the 6th gear would have done but to make the 5th gear slightly shorter and take its place. GT feels better than the Ninja and more desired of the two at lower rpms in terms of engine response. The big concern coming out from majority of the guys we have talked about is the air/oiled cooling and its effectiveness. We were also concerned about this bit as the GT650, despite being a proper liquid cooled, engine is slightly on the harsher side when it comes to heat dissipation. To our surprise, heat emission on the test bike which we got was absolutely manageable in all kinds of terrain we rode it on which included congested city rides of FC and University road, long and open Pune Bangalore highway stretch and twisties of Lavassa. It does get higher on the legs when you are caught in dense traffic amidst commuters gazing at you as if you are from a different planet. But the heat soon dissipates as you hit ‘more’ open roads. In our long spirited speed runs also (which were obviously on highways) the bike never felt uncomfortable in terms of heat. Another surprise! GT felt at a LOWER temperature than the liquid cooled Ninja wherever we stopped for whatever things. 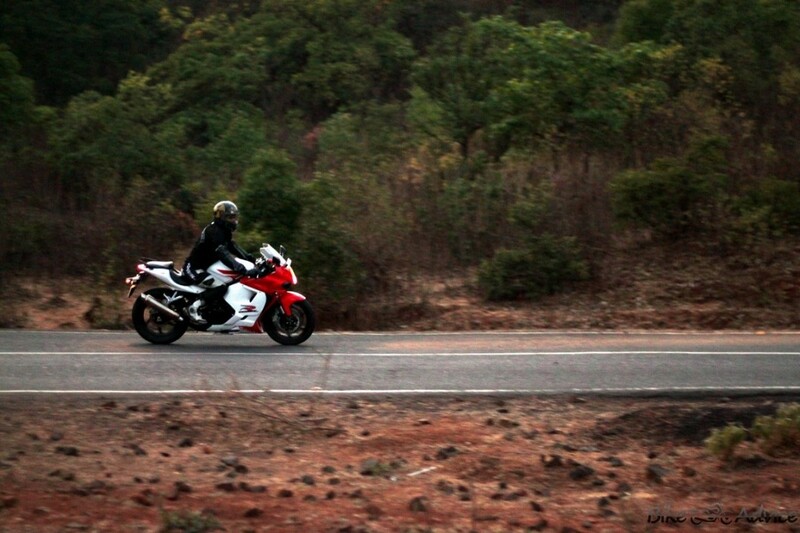 This was also acknowledged by Rishabh, who has been burning petrol on a Ninja for the past 12,000 kms. A major achievement from Hyosung! GT feels better than the Ninja at lower revs or sudden maneuvers. Had the bike been a little lighter and with a slightly less-fatter tyre, things would have been much better as we feel. A 140mm thick rear might have helped in better acceleration as well as lesser drag. But overall you would not be disappointed by its performance and on-road behaviors. When we took the bike from Hyosung, it had run only 2037 kms on the odo with the fuel guage showing up all possible bars. After a shorter 70-80 kms run, all the bars slumped like our share market and we were shown only 2 bars. This forced us to get it fuelled again as we filled in Rs 500 of more gas into it. The bars rose again to its zenith. And when we returned the bike after riding 200 odd kms, there were 8 bars teasing us out of a total of 9. The first stint (before fuelling) included city rides and highway sprints and the later one included twisties of Lavassa. This takes us to a point where we cannot pass any judgment on the fuel efficiency bit but can only point to an erratic behavior of its fuel gauge, possibly. However, according to a few international and internal reports GT has been found to be decently frugal at somewhere around 29-30kmpl of an overall fuel efficiency. And with its humongous tank size of 17 liters, this translates into a range of 490-500 kms before the bike would budge for a mandatory fuelling. PRACTICALITY: You wanted the supersport, here it is FOR YOU! GT250R’s riding posture is as good or bad as a supersports class bike. Now whoever feel that is good, skip reading this paragraph. The posture is such that you have to reach out for the handlebars with your torso just touching the tank all the time with the knees forming an acute angle. The complete stance looks a mirrored inclined alphabet ‘Z’. I am a little taller than 5’9 and as this height decreases, this ‘Z’ would shrink further. Your back is at a position which it would curse its fate for being yours! No matter how hard you try some weight does get onto your wrists and hands due to the posture. The seat is not comfortable either. It’s a little curved from the wrong angles and a flatter seat might have helped. I tried every bit what I can, but was unsuccessful in finding a posture which could help me ride this bike with a bit of comfort. Turning radius and weight would kill you. Pillion would become your foe until she is your girlfriend! So everyday practicality is definitely a question mark. On the other hand, we have passionate bikers, who have accepted R15’s form of riding posture in regular ridings and many have toured for many thousand miles on that bike. Obviously posture on the GT is much more aggressive but if you belong to this cadre of people, GT would provide you with a super sport class bike experience at one fifth of the cost! The rear view mirrors provide a lovely view of the back and have a wide span view of all that is happening behind your back. 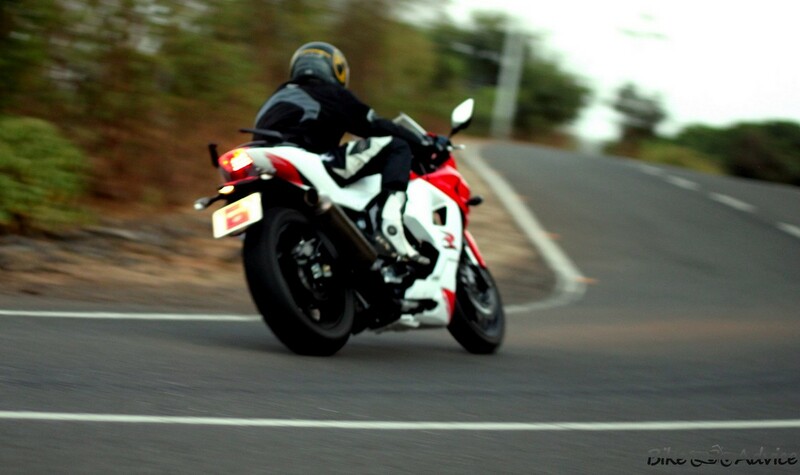 The good part is that they do not blur or vibrate as much as the ones on the 650R do. We would not award any points here. If you like it, you like it! Hyosung has not disclosed any pricing details of this bike. The company is keeping a secret and possibly wants to carry a thorough market research before announcing the pricing of this bike. It must be noted that this bike, unlike CBR250R which is made in India, would be brought in knocked down units and assembled here attracting more duty and hence a premium over the CBR is expected. However, according to the hints we are getting currently, talks are as high as a 2.5 lac price tag or possibly even more, which definitely seems to be one thing Hyosung might want to reconsider if they plan to sell this bike to masses (from the segment perspective). 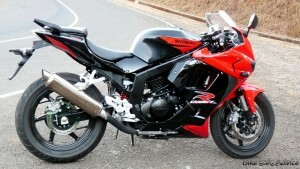 Hyosung also has plans to launch the naked version of this bike similar to the 650 series at a later stage. 1. Side Stand goof-up: If you look at the picture, you would be able to make out the issue. CBZ Classic owners had to fold the front footpeg to kick start their bike. Similar irritant is found on GT. If you want to deploy the bike on its side stand you would need to fold the left front footpeg through your heel to get it down! Considering side stand is the only rest-tool this bike has, people need to be really cautious else there are good chances that the bike would tip over. 3. Tyres: GT250R comes shod with fatter rubbers branded by Korean firm Shinko. Same company tyres are used in ST7. 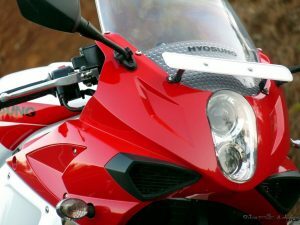 However, Hyosung might have used a slightly thinner rubber to improve performance and fuel efficiency. 150mm is the thickest tyre in this segment. Also, despite their width, they do not provide the same kind of confidence. 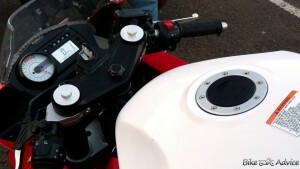 Bridgestone Battlax on GT650R were leech-like and similar setup would help on the smaller GT as well. 4. SEAT: If you notice the seat, the cover is immensely slippery and loose which makes the rider move about at his own place, not helping matters. Seat could be properly contoured as well. 5. 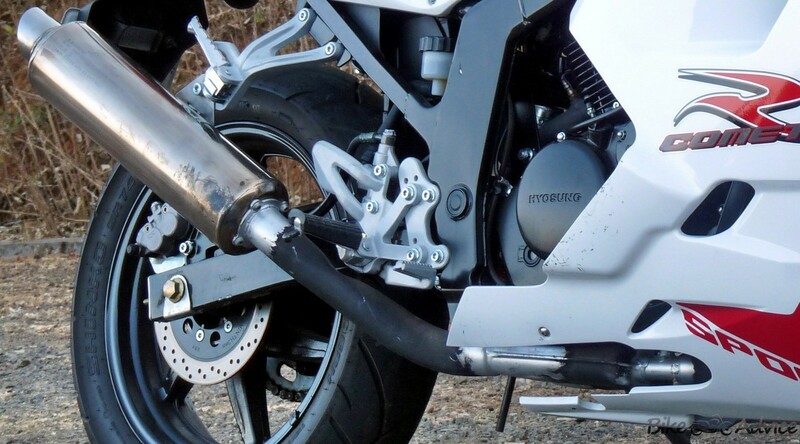 Exhaust: You can see unpatched spots on the exhaust as well as its pipe joint. Plus, it doesn’t come with any heat shield. 6. Tank Contours & finish areas: The following pics gives you an idea of the tank sculpting. 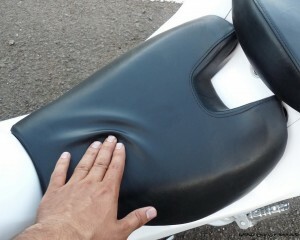 Look at the badly finished areas and gaps around the seat. 7. Pillion Seat:As with supersports generally, Pillion has to sit, if et all you manage to convince anyone, 2 floors above you. Pillion seat not made for carrying passengers! Try this occasionally only. 8. Tank Size & Knee Recess: Look at the humongous size of the tank. It has got a capacity of 17 liters. However, the best part is the way Hyosung has prepared its ergonomics. It has got a lovely knee recess where your knees get neatly tucked in. 9. The Brake play adjuster: That round thing marked with numbers you see there is a big culprit. You can adjust your brake’s play with this, however, it played foul with me. Whenever I tried position ‘1’ it slipped onto ‘6’ at its will. Finally, I had to settle for ‘2’. Hyosung has to avoid small niggles like this. 10. 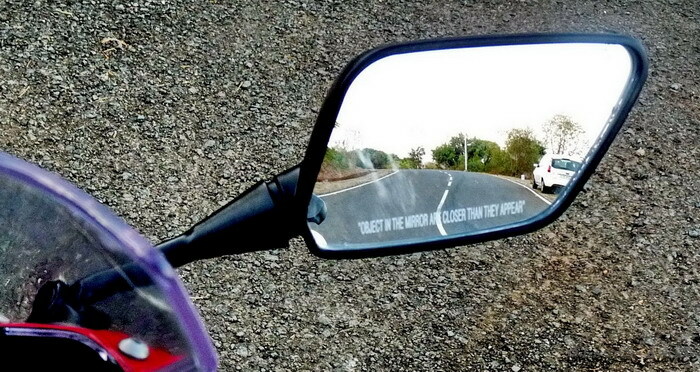 Rear View Mirrors: Like the GT650R, rear view mirrors provide a lovely view of what is happening at your back. Look at the pic, the span is so wide that you can see the complete road. It takes a little effort in reaching to these RVMs from your seat. 11. 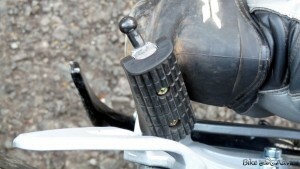 CLIP-ON handlebar: It takes a lot of stretching efforts to grab the handlebar. You have to take your hand off the bars when you are trying to take a U-turn. Play is very limited. 12. No Hazard or DRLs: Observe the little change here from the 650R. There is no hazard switch and no daytime running lower projectors. Swithgear quality is fairly good. 13. 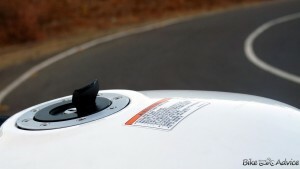 Fuel tank lid: Observe the small gap there. There are chances of water seeping through. 14. Red/Black GT250R: Here is a pic of the other GT250R which was provided to the media. The white one looks the best to me. 15. Adjustable Footpegs: This is one useful feature on the GT. You can adjust the front footpegs according to your liking and comfort (whatever little you can get). There are 3 adjustments possible. 16. GT250R Night Vision: GT250R comes with twin projectors stacked over one another. While returning from Lavassa, we could test its illumination in dark and needless to say that the projectors do a fantastic job. The only little issue I observed that due to their positioning, the spread is not very wide as the Ninja’s setup provides. However, it brings to life the darkest of roads and illumination is better than Ninja. 17. 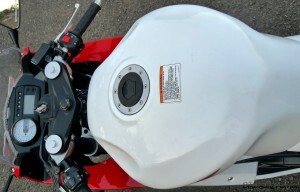 Side Stand Ignition lock system: GT250R comes with side stand ignition interlock system which doesn’t allow the bike to start in case the side stand is employed. However this thing did miswork a couple of times on our bike. It didn’t start without the clutch but did start with the side stand down. 18. GT250R and Ninja side by side: This gives you a clear glimpse of how big the GT250R looks in front of the Ninja. It looks even bigger than the CBR250R. 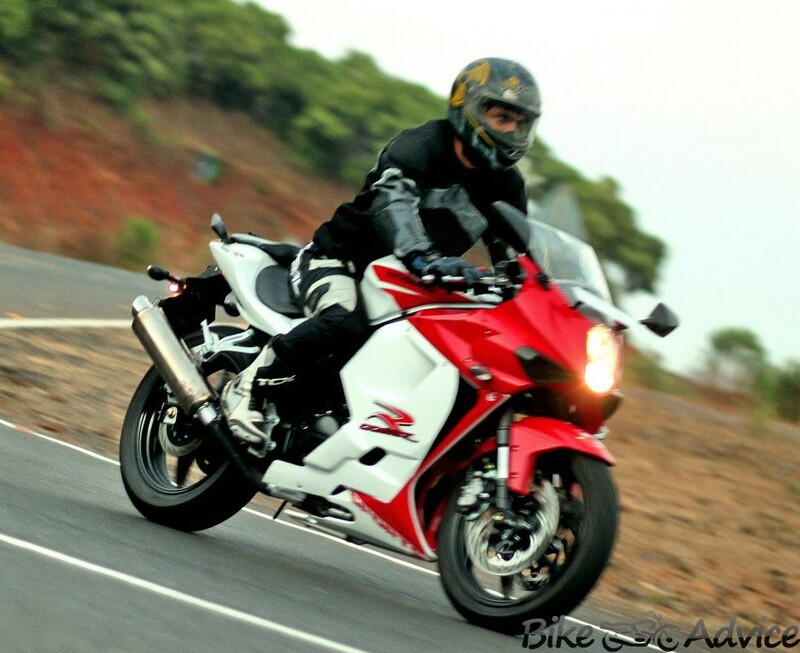 BIKEADVICE VERDICT: Immensely potent motorcycle, if Hyosung manages to price it well! This brings us to a very important conclusion point. Read on to understand our stand on this. The bike looks huge and no normal joe would be able to tell that this is only a 250cc bike merely. So, it’s an apt bike for people who want to own something really big without burning a hole in their pocket. Not that its all white skin, this bike showed a lot of internal character as well. It has meaty exhaust note which is really a treat to ears. It has linear power delivery which is a more reassuring characteristic if you don’t like mid-rev tantrums. GT250R is the only bike which provides superbike characteristics in this segment. GT250R has fantastic highway capability, both in terms of keeping up good cruising speeds as well as its poise on higher speeds. The super-sports seating posture does get on you but this is the best bike aping a full-liter class bikes posture, possibly more. 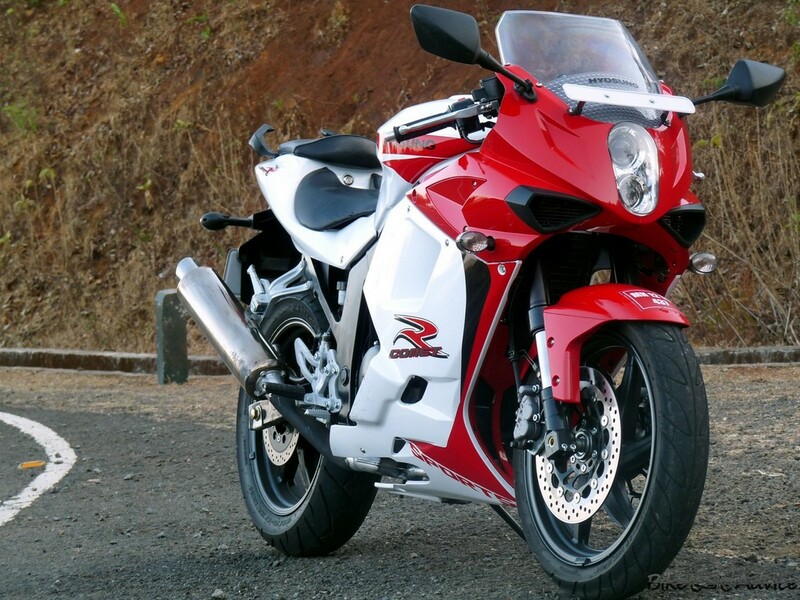 So tomorrow if you ride an R1 or say Fireblade you would not feel at an unwanted house. One thing which only the GT provides in this segment is the feeling of ‘attitude’. And for the sake of this attitude if you have to compromise on comfort, then be it! BUT BUT… Hyosung needs to provide it at a more sense making price to ensure a good run at the chart. This might not turn out to be a really good deal at the current murmurs of 2.5 lakhs. Agreed, Ninja sells even at humongous and unjustified prices, but that’s a Kawasaki! All I want to say is, it is the brand perception which acts here, Kawasaki obviously being the better ‘perceived’ of the two. Hyosung needs to sell this product to as many people as they can to further spread the word and feel about it. Agreed that you are importing this and majority of those go as duties and taxes but that might not matter to buyers in this case. Agreed you might be bringing the naked 250 at a price lower than this and this price point gives you a leverage to place it in between, but that might not be the way crowd would look at it. A very apt price point for this bike to make it a huge success would be a 2 lakh barrier. I am sure Honda would have their job cut off if these murmurs would have been in the whispering world of today. If not, then neither the Honda nor the Kawasaki would be worried. Come on Hyosung Garware, pull off a blinder on 7th June (which is expected to be this bikes launch date)! This is a very potential bike, make it sell. 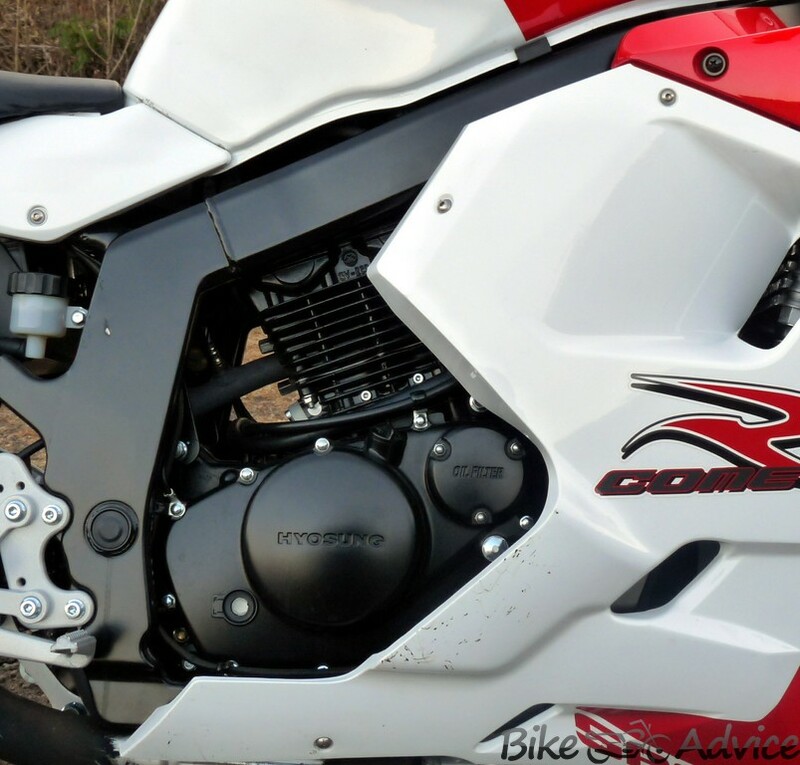 Hyosung GT250R Comet Road Test Review written by Saad Khan. If you have any questions? want more high resolution pictures? 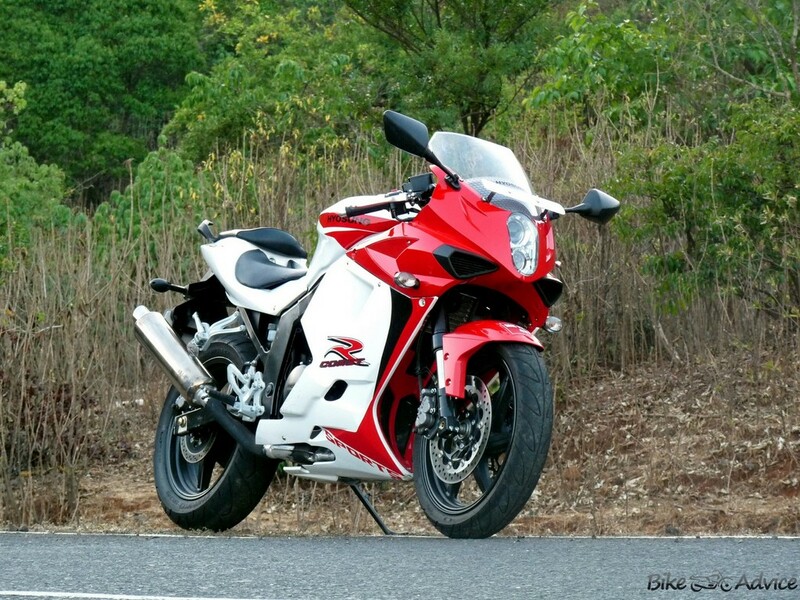 then follow GTR250R Discussion at our forum. You can also post your feedback in your comments below.